CAPE CANAVERAL, Florida -- The launch of a Space Exploration Technologies (SpaceX) Falcon 9 rocket carrying six ORBCOMM Generation 2 satellites is scheduled to liftoff at 9:47 a.m. EDT on Saturday, May 10, 2014 from Space Launch Complex 40 at the Cape Canaveral Air Force Station in Florida. 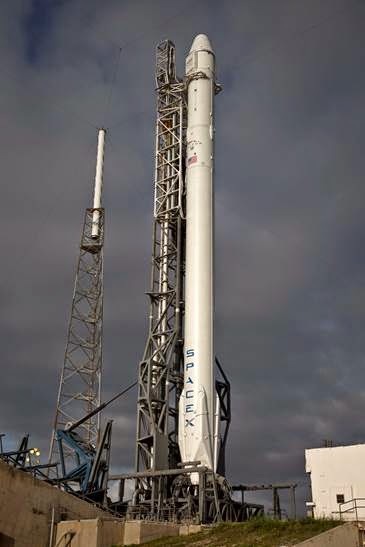 The most recent forecast issued by the U.S. Air Force 45th Weather Squadron predicts a 70% chance of overall permissible weather conditions for the SpaceX launch. The primary weather concern for launch are thick clouds and cumulus clouds. The Falcon 9 will deliver the telecommunications satellites, weighing 170 kilograms each, to an elliptical low-Earth orbit. If all goes as planned, the six satellites will be deployed one at a time, beginning approximately 15 minutes after liftoff. Where Can You Watch The May 10, 2014 Rocket Launch? The best place to watch the SpaceX launch is from the Canaveral National Seashore just north of Kennedy Space Center. Admission is $5 per car. The park opens at 6 a.m.
Also, the Kennedy Space Center Visitor Complex is opening early at 6 a.m. for the launch. There are several locations available for guests to view the launch. A limited number of special Launch Transportation Tickets are available on a first-come basis for the closest public viewing area at the Apollo/Saturn V Center. The special transportation viewing tickets are $20 in addition to general admission.